Fujutsu was boasting that the F-07D was the world's thinnest handset, until Huawei came and trumped them by a millimetre, taking the sting out of a great headline. At 6.7mm thick and weighing just 105g, the Fujitsu is now the world's thinnest waterproof smartphone, and while that might take away some of its glory, it's still a nifty, svelte device with a great screen. Fujitsu makes its devices waterproof as standard, and while that might seem an odd differentiation in this market, it actually makes a lot of sense. Water damage is the leading cause of insurance claims on smartphones, and protecting your handset against drops into the toilet, and careless pint spillages will save a lot of people time and money. While it is thin, the F-07D does lack punch. Under the hood there's a single-core 1.4GHz Qualcomm processor, which feels noticeably sluggish in the hand, when navigating the operating system, and using the camera. This sluggishness was most noticeable when using the camera, which was slow to load, focus and seemed to take an age to capture a well lit image. Having spent much of our time playing with new quad-core devices, a jump back in time to single core was noticeable. However, while the camera wasn't fast, but it did focus nicely with plenty on macro options to play with for those who like to get creative. The 5MP camera took adequate shots, and while there was no nifty manual focusing touches, like you have on the iPhone 4S, each shot we took came out clear and sharp. The F-07D runs Android Gingerbread as standard, but we were told by Fujitsu that the handset was upgradable to Ice Cream Sandwich via the built-in update facility. If we have to save special praise for the Fujitsu F-07D, it would be for the excellent screen. 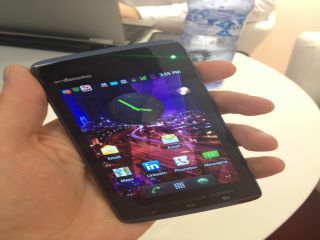 Fujitsu has packed a 480x800 Super AMOLED screen into the smallest of handsets, and it looks fantastic. Colours are vibrant, and the whole Gingerbread OS looked pin sharp and vibrant.